Sleep on the left side is good for health. 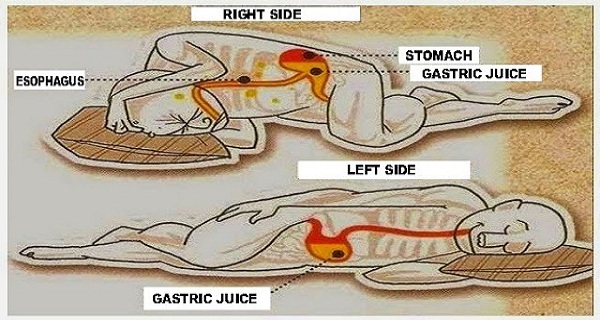 The position that we take while sleeping has a significant influence on our digestion. In ancient times, the monks used to lie down after each meal just for ten minutes to improve the digestive process. Moreover, the most ancient tradition of oriental medicine (ayurvedic) as well as the Indian alternative medicine suggest sleeping on the left side. The reason is very simple. The left side of the body is the dominant lymphatic side. The majority of the body’s lymph fluid drains into the thoracic duct, located on the left side. Along the way, lymph fluid carrying proteins, glucose and other metabolites and waste products is purified by lymph nodes and is then drained into the left side of the heart. Spoon Massage Incredible Effects Only In 12 Days! ARE YOU A “HEYOKA” EMPATH?